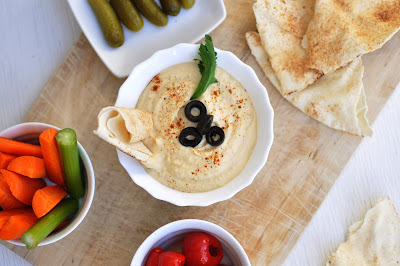 Hummus is a very popular Arabian dip. It's being used as an appetizer and dipped with pitta bread or raw vegetables. It can also be used as a healthy spread for wraps and sandwiches. In my ambitious attempt to make everything as healthy as possible, I tried to make the hummus with dried chickpeas instead of canned ones: Soaked them overnight, cooked them, etc. But the hummus didn't turn out so well. For some reason, the canned chick peas are much softer and thus much easier to mash. The hummus becomes much smoother. You can play around with the amounts of each ingredients according to your taste: more of the Tahini will give it a heavier texture and taste. I normally don't add much olive oil. And I never put more than one garlic clove in since raw garlic tends to repeat on me for quite some time after the meal. Combine all ingredients in a food processor and blend to a smooth paste. Transfer to serving bowl and garnish with a few sprinkles of paprika powder and flat parsley leaves. Keeps well in airtight container in the fridge for a few days.